bliss is software that organizes your music files automatically. 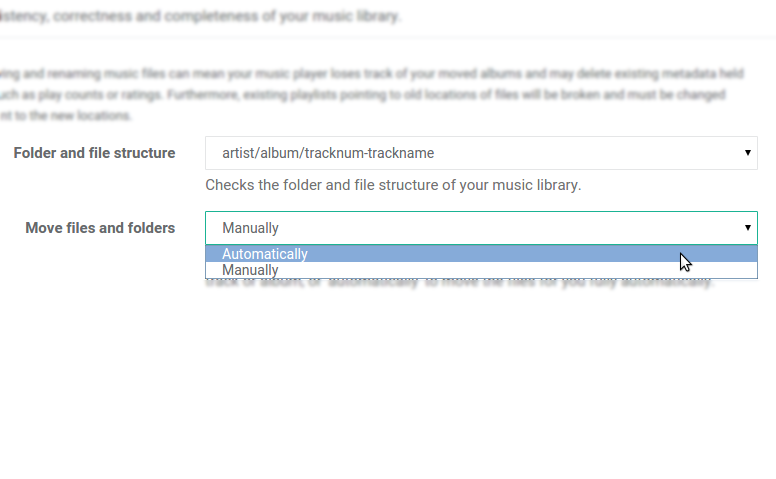 It works in the background, restructuring your music folder to ensure consistency with your music tags. Synchronize with music tags for consistency. ... or manually with one click per album, it's up to you. No interruptions! Install on a server and access remotely. We've organized our digital music collections for years with manual 'music taggers'. We select files, we multi-update, we've-tried-to-remember-the-genres-we-use and then we curse as we scroll through our playlists and find inconsistent artist names, years of release and split compilations. As your digital music collection grows, the manual tagging approach becomes more error prone and requires more effort. 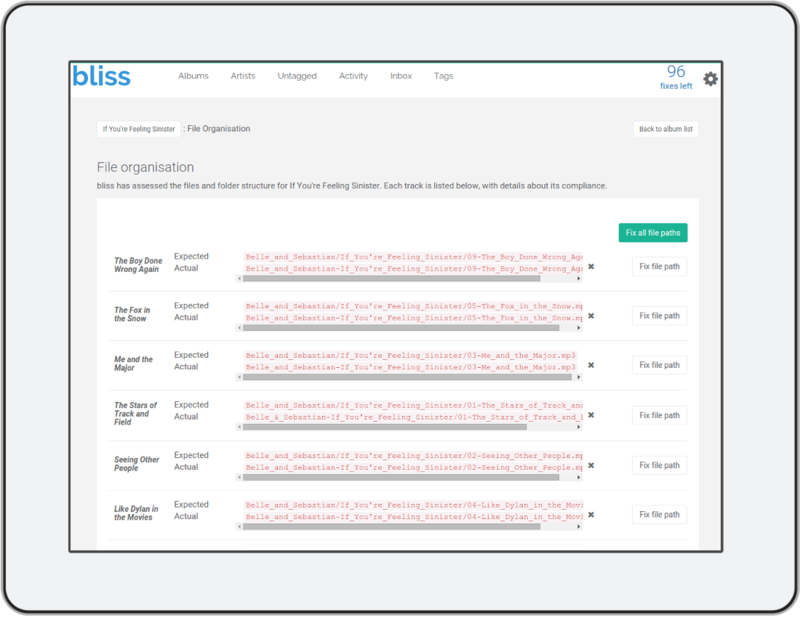 bliss works the other way, by allowing you to specify rules by which your music collection is assessed and then automatically fixed. bliss then checks the file for each track in each album to make sure the rule is obeyed. Michael Jackson/Thriller/05-Beat It.mp3? Fine. Michael Jackson - Thriller/Beat It.mp3? Wrong! 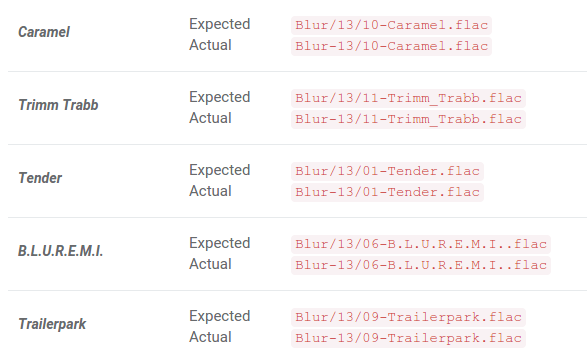 Time to rename... which bliss can do automatically, or you can confirm with one click for each album. 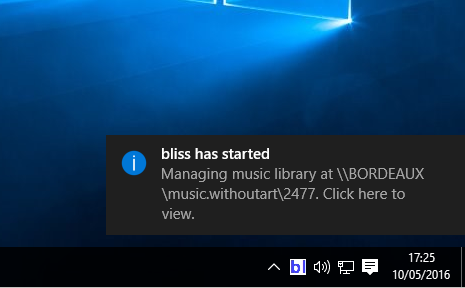 bliss works in the background, unobtrusively watching your music collection. When music is added or updated, it automatically assesses the music against your file structure pattern, fixing what it can, and letting you know if it cannot. If you change the name of an album using a music tagger, bliss will assess the file structure of the music with the new tags. bliss has a Web based user interface, which means it is accessible from anywhere on your network, or even across the world. And it's not just file structures. bliss is also an automatic album artwork finder and organiser.